View of “Financial Times,” 2014. The sculptures and paintings in G. T. Pellizzi’s latest exhibition, “Financial Times,” cast the global economic system as a ubiquitous and disembodied mythology, able to be manipulated by those few—financial analysts, gurus, stockbrokers, and pundits—who claim a special kind of mantic money power. In the center of the gallery are three sculptures, all jungle gyms of steel pipes rested atop stacks of finance-guru books, including classics like The 7 Habits of Highly Effective People. Taken together, the sculptures connote buzzwords like “networks,” “team building,” and “pipe dream,” as well as the exposed steel pipes of loft spaces of yore, now recapitulated into aesthetic objects nestled into a commercial gallery space. All the works in the show are made from construction materials. 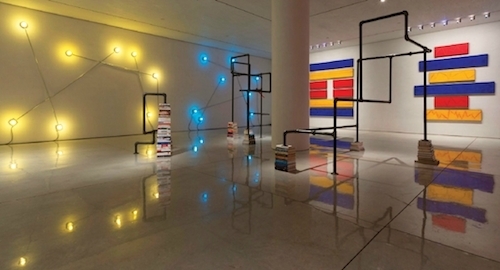 Constellation(s) in Red/Yellow/Blue (Figures 1–3) (all works 2013) is a series of three light fixtures, made of long crisscrossing steel poles, each of which has a colored lightbulb attached to its end. Pellizzi has selected colors that allude to those found at construction sites: The bulbs of the first fixture are scaffolding-blue, the next yellow to reference temporary flooring, and the third connote red painted steel pipes. These Mondrianesque structures recall diagrams of constellations tracked for the purposes of divination, as one now tracks the movement of a line through a financial graph. Another tool of divination is referenced on the far wall: In Financial Times (I Ching, Hexagram 61) six canvases—two blue, two yellow, two red—are arranged into the I Ching hexagram of “Inner Truth.” The artist has snapped a chalk string against the surface of each canvas; this tactic references snap lines, which are used in construction to delineate a straight line in a space before building. A chalk line horizontally bisects the picture plane of each canvas, reinforcing the geometry of the hexagram and, by consequence, the peace and stability that the shape embodies. Its darker twin, the similarly-sized Financial Times (Graph, Figure 1), rests alongside: a red, blue, and yellow bar graph, snap lines zigzagging throughout like the graphs of the stock market.